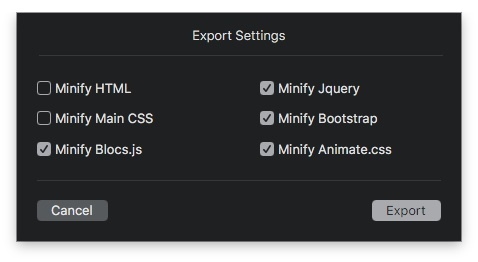 I just wondered about the recommended export settings for Blocs. When looking at the defaults I see the options to minify CSS and html are disabled by default. Are those likely to break things or cause problems if enabled? I started thinking about this after finding that a hero image is failing to load in the web browser on my TV when checked there, but seems fine elsewhere. I also wondered about that old chestnut of consolidating CSS, which does not appear to happen with Blocs. Is this something that is planned for the future? I know that consolidating CSS is counterproductive in some instances, so I’m just curious to know the current thinking on this subject with Blocs. No… they’ll just make the code a lot less human readable. Google prefers minified files as they load faster. If you have no need to make changes post export, or to look at your code to see why something is not appearing the way you intended, there is no downside to minifying everything.